But Padowitz reiterated his client’s innocence. “It’s a tragic situation, but I believe the evidence in this case is going to show that my client did not violate Florida law in any way whatsoever,” he said. DAVIE, FLA. (WSVN) – A South Florida family is asking for answers after their loved one was fatally shot outside a Davie CVS. The family wants police to hand over the video that showed the encounter between 20-year-old Andre Derek Smith and 38-year-old Matthew Barry before, investigators said, Smith was shot and killed. According to police, Smith met with Barry for a Craigslist sale of a cellphone in the parking lot of the CVS located at 4610 South University Drive, Nov. 1, at around 1 p.m.
Officials said there was an argument between the two, and that’s when Barry went into the drug store and Smith followed. That’s when Barry asked an employee to call 911 as he tried to get away from Smith, police said. Investigators said Barry ended up shooting and killing Smith inside the store. Police said that surveillance video inside the store appears to support Barry’s version of what happened. Barry has not been charged in this case. Attorneys Jose Baez and Jasmine Rand are now representing the Smith family. “To date, this family’s right to view that video to see what happened to their son has been denied,” Rand said. They said they are ready to file a lawsuit under the public records law. Baez and Rand are also accusing police of being insensitive from the moment Smith’s family got the knock at the door. “‘I’m sorry your son is gone, but the media is gonna release it Thursday, and they are going to make it seem like it is a race thing because the shooter was white,’” said Goulbourne-Smith. Davie Police told 7News that they will not release the video because it’s part of an ongoing investigation. “This family didn’t make this a race thing, Davie Police Department, you made it a race thing,” said Baez. 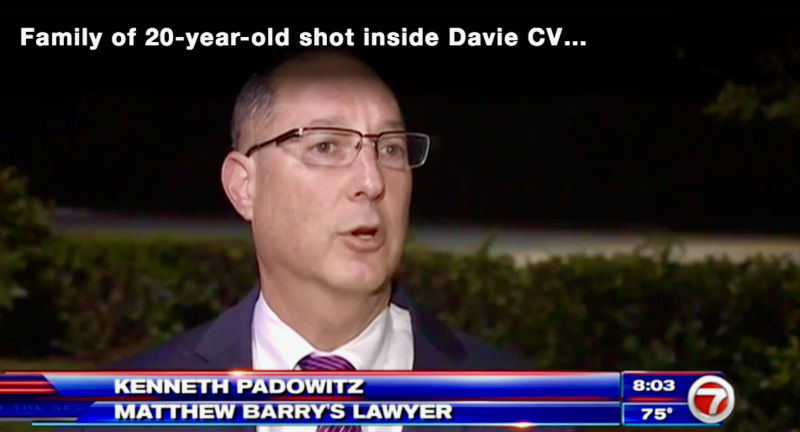 There were also other allegations that were made against Davie Police. The department is planning to host a news conference on Thursday to address the matter.